Spend enough time in the backcountry and sooner or later, you’re going to have to do some business. What we see as an easy task at home or at a rest stop can become a bit more of a challenge depending on where you’re at. In a lot of cases if you’re at an established camp site in a national or provincial park, there will be an outhouse or something similar, which is usually a good thing. If not, then hopefully you have brought a trowel along or have some other means of digging a hole in the ground. I don’t think I need to describe what that is for. Out of consideration of others, there is a right way and a wrong way to get it done. and no one else who comes along wants to see piles of used toilet paper littering the bush. Sadly, though, I have seen that far too often people just don’t hide their traces and generally speaking, the more accessible a location is, the more likely you’ll find the inconsiderate results. 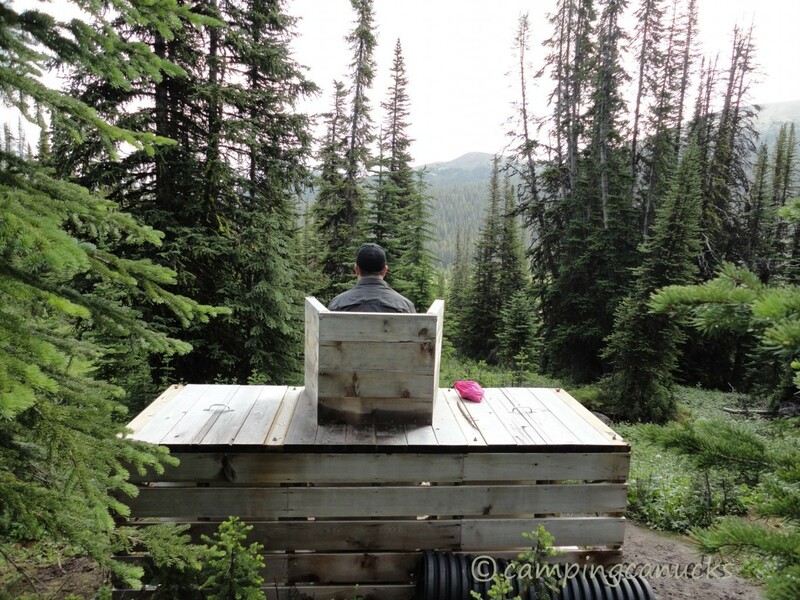 The range of locations I have seen runs from the simple and time proven hole in the ground, to the incredibly luxurious backcountry outhouses of some American parks. There are many places I’ve been where people have been coming to for many years so it’s not uncommon to find the ‘home made’ potty in the bush. These can range from something as simple as a board with a hole in it all the way up to some pretty elaborate setups that may or may not have walls. Usually they’re located in a private setting but not always. Case in point; at Poplar Point Park, the crapper is clearly viewable from a nearby picnic table. Not very private so you’ll have to make a game time decision as to whether that is better than a hole in the ground. Poplar Point’s home made potty. It lacks privacy. 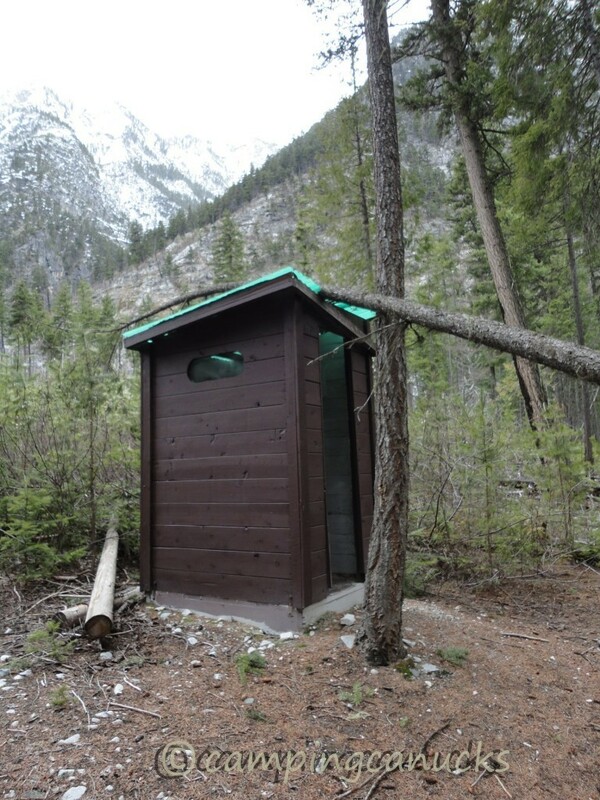 Most provincial parks in BC seem to have had their outhouses sourced from the same location and generally tend to be quite similar. Usually brown on the outside and white, or what used to be white, on the inside. Pretty standard stuff and their cleanliness and smell largely depends on location and how busy they are. Of course, there are random factors to consider, such as tilt (or nearly falling over) and objects that have fallen on them, usually trees. Another type that one sees often at both provincial and national parks is a round green cylinder with a toilet seat on top. Tends to be clean since it’s exposed but can be a hassle since it’s exposed. Heavy rains can really make using these types of toilets a challenge. But at least you would see a bear coming. Stein Valley Suspension Camp outhouse. In the Rocky Mountain national parks, you can encounter many different types and it all seems to depend on when they were placed. For the more sensitive locations, Parks Canada will use large barrels which are under a platform that you climb onto where the toilet seat is located. Simple and effective but also exposed to the elements. 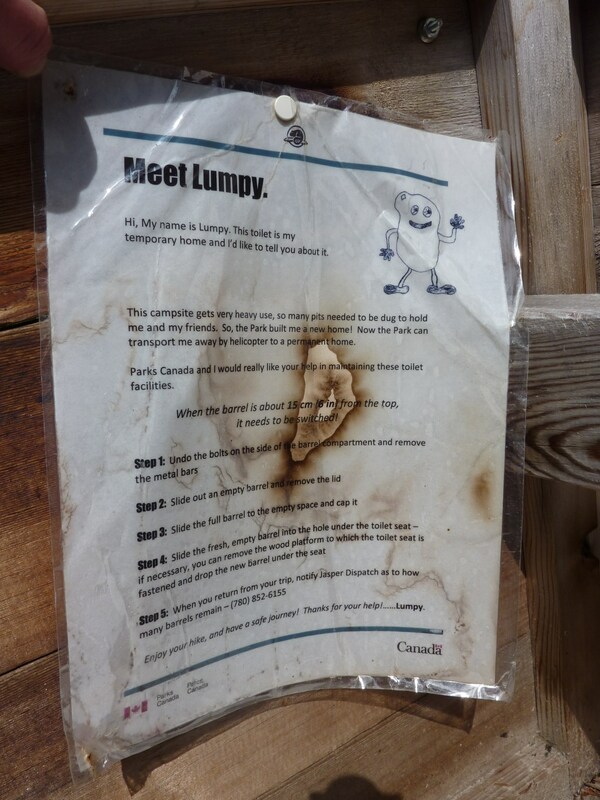 Parks Canada affectionately calls them “Lumpy” and has a little sign with instructions for what to do when the barrel is full. If you report full barrels, they will dispatch a helicopter to pick them up and dispose of the waste somewhere else. I will admit that the first time I met Lumpy I hoped I would never have to be the one to have to change barrels. Alas, that was not to be. 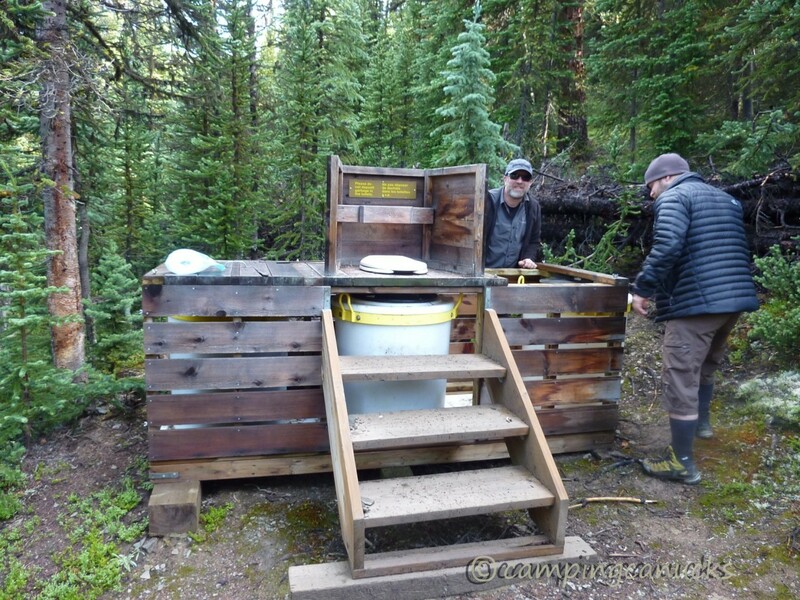 In 2013 while we were doing the Brazeau Loop Trail in Jasper National Park, we hit a full barrel at one of the sites. It was quite obvious that no one else had wanted to change it as this thing was full up. We also considered pretending it wasn’t full but after some discussion about the physics of splash back, we decided the right thing to do was to change the barrel. It was a foul job. I’ll leave it at that. The look on my face says it all! At other camps, you will sometimes find other obstacles that make the backcountry business more challenging. 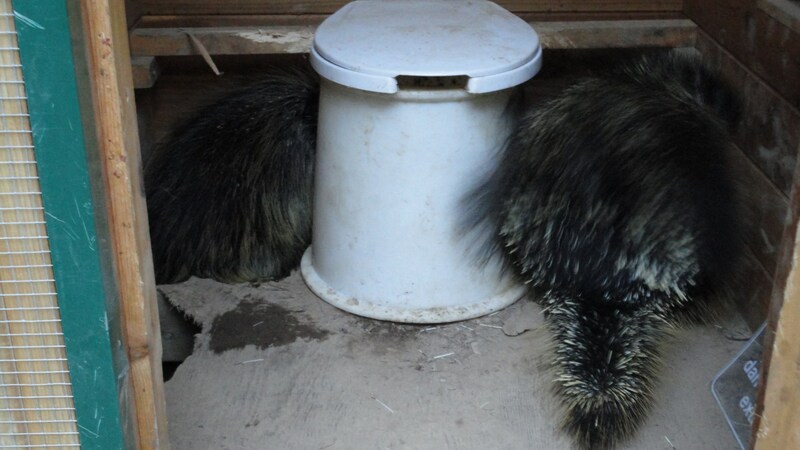 Case in point; porcupines in an outhouse at Floe Lake. 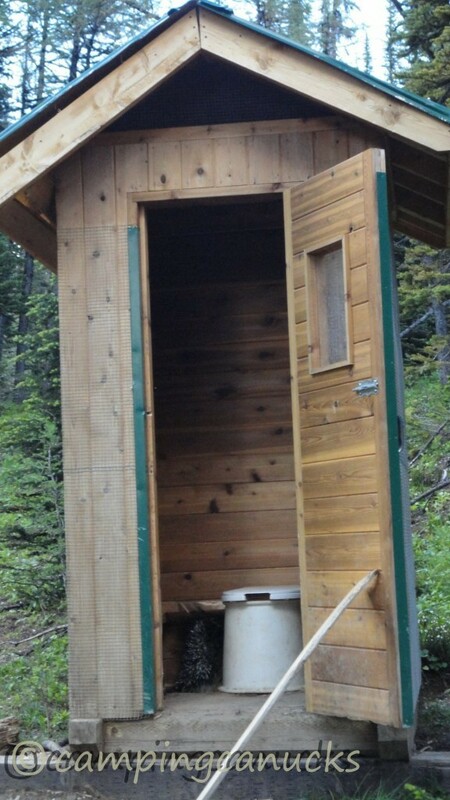 There’s nothing like needing to go, finding that the outhouse is in great shape (so it appears), and then being unable to use it. At Floe Lake, we noted the outhouse was covered with chicken wire. Why is that you ask? Because some critters, like porcupines, like to chew through wood. In this case, the porcupines had dug under the dirt, got around the wire and then chewed their way through the floor. At first there was only one porcupine but after we angered him, he called a buddy. Now there were two porcupines occupying the shitter. 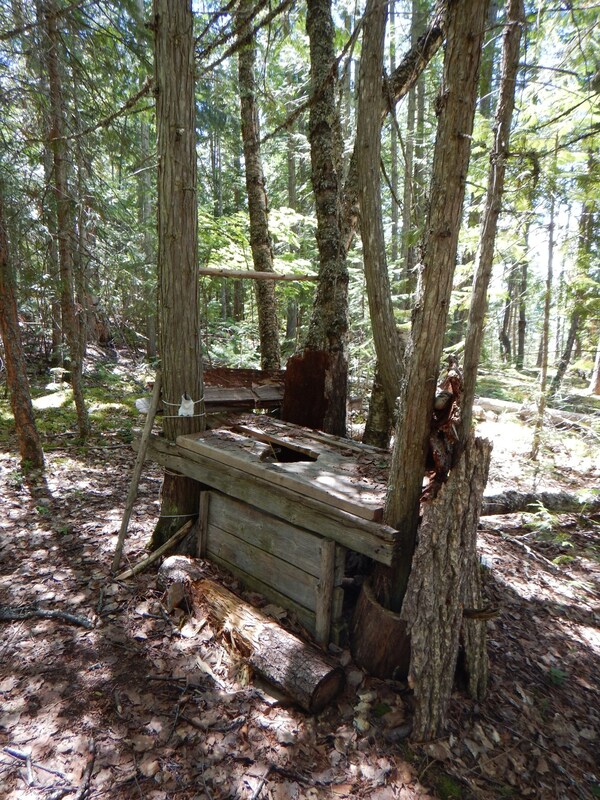 Fortunately we were able to find another outhouse in the area that had not been invaded. And now two angry porcupines! 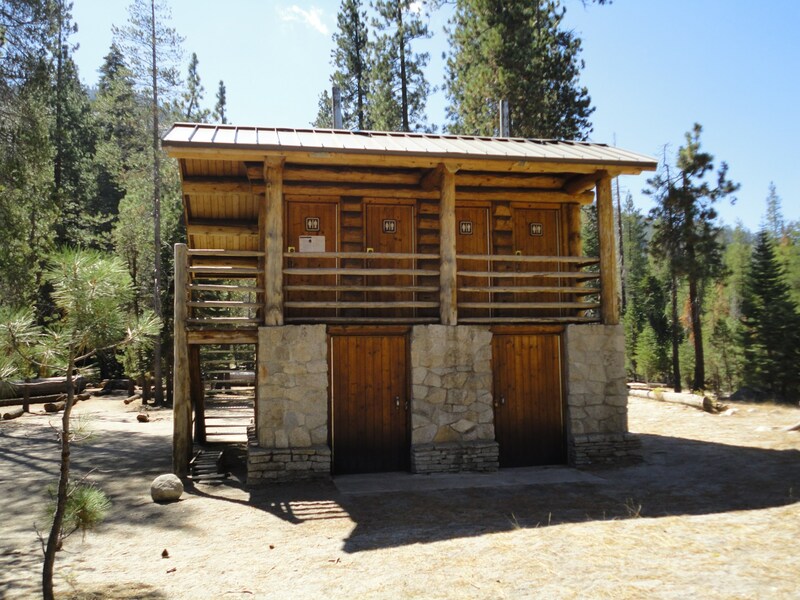 Last year in Yosemite National Park in California, I saw what had to be the most amazing outhouse I’ve ever seen in the backcountry. Granted this was along the famed and busy John Muir trail but I was half expecting to be served caviar and champagne while visiting! I found out later that the US Parks Service ships the full barrels down by mule. That is one mule train I hope to never meet. 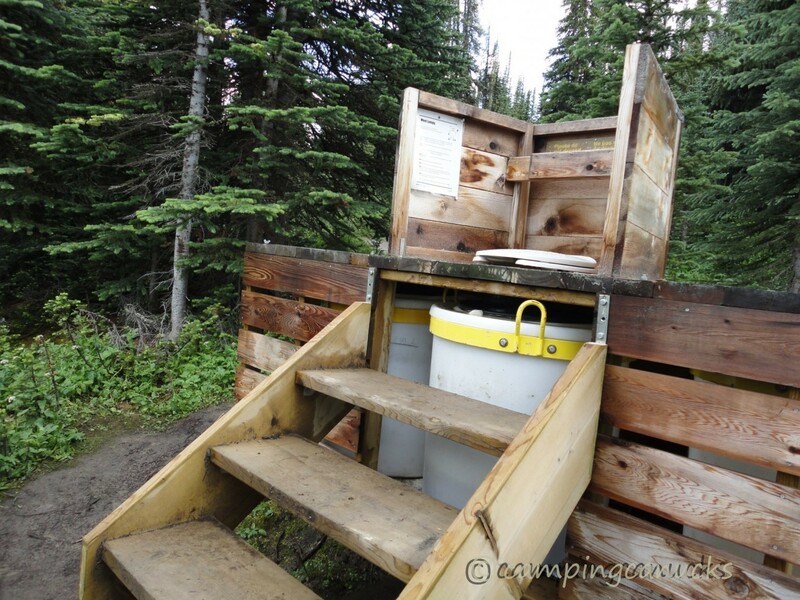 The Hilton of backcountry outhouses! In the end, and as gross as it may seem, backcountry business can be good for some laughs and entertaining moments. Just a note; don’t forget the toilet paper. There’s a lot of yelling involved until someone understands your need and once they do, they’re bound to bring along a camera. Laughing out loud doesn’t even cover it. Awesome info, my friend. I’m glad you enjoyed it! It was fun to write.